Keeping your pug well groomed not only helps with the hair floating around the house, it keeps them healthy as well as smelling & looking good. But every pug owner needs some grooming tools in their arsenal at home. I continue to share, in part 2, 10 essential grooming tools for pugs. If you missed part 1, check it out here first. 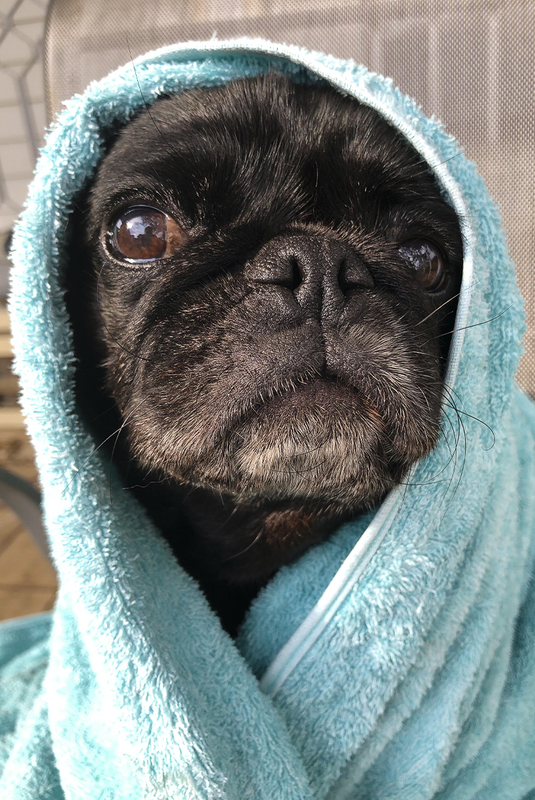 Bathing your pug is not only important to keep them clean and smelling nice, it is another way to help remove excess hair and promote healthy skin and coat. But what you choose to bath your pug with can affect their overall health. As with human shampoos & conditioners, dog ones are often filled with chemicals that are designed to remove dirt and smells but at the same time strip all of the good oils from your pugs skin & fur. This leaves your pug’s coat dry and dull. A conditioner then uses more nasty chemicals and treatments to put oils and shine back into the coat. It is an awful lot of nasties to get your pugs coat to look and smell good. This is where choosing an all natural shampoo & conditioner that contains no nasties is perfect. 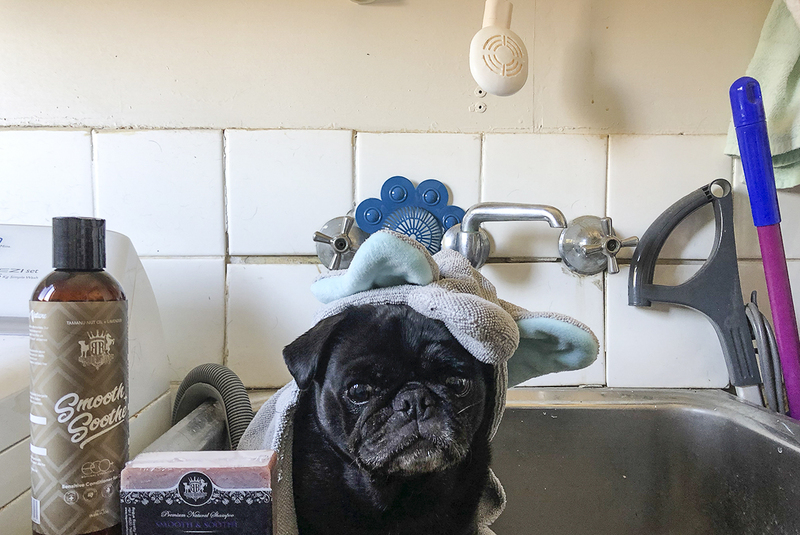 You can safely wash your pug knowing that you are not using harsh chemicals which in the long term will affect their overall health & wellbeing. Now when it comes to choosing a natural shampoo & conditioner, you want to look for ones that contain natural products such as healthy oils like coconut oil, almond oil, olive oil, wheat germ oil, hemp seed oil and essential oils likes eucalyptus oil, tea tree oil & other dog safe essential oils. It should be sulphate & paraben free, contain no synthetic fragrances, no soap or silicones, no DPG, TEA, DEA or Pthalates, no artificial colours and no mineral, castor oil or animal products. It should be made from plant derived, preferably organic, ingredients. And bonus points for those not tested on animals. 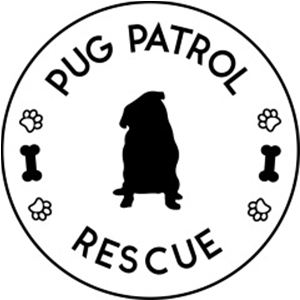 There are very few shampoo & conditioners I would recommend for use on your pug. The 2 mains ones I would highly recommend are made here in Australia. The first is made by a small business local to me. Rogue Royalty make their own natural shampoo & conditioners that contain no nasties. 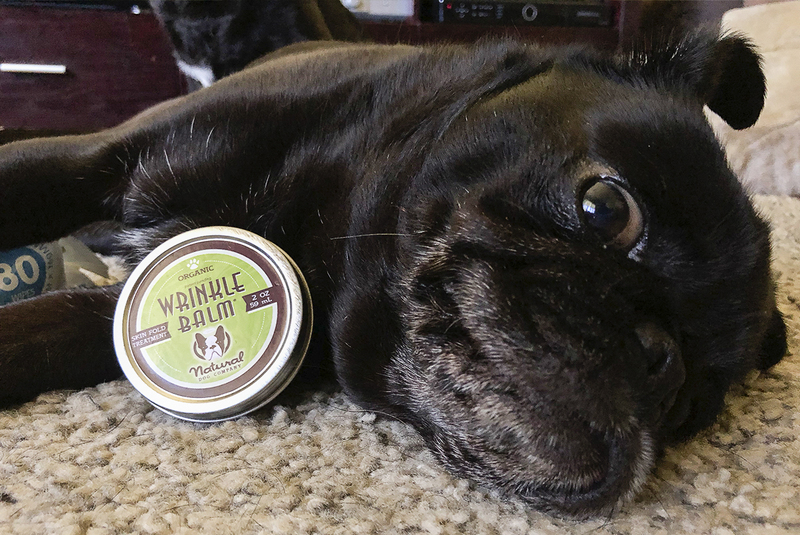 They will make your pug look good and smell even better. They do an everyday and a sensitive skin shampoo & conditioner as well as a mineral milk lotion for those needing relief from their allergies. The other I highly recommend is Essential Dog. Made from essential oils, these are gentle on your pugs skin, great for their coat and smell amazing. They have everyday and sensitive skin shampoo & conditioners as well as some other amazing natural products and grooming tools including a deshedding tool. It is a difficult task bathing a pug without an easy & effective way to rinse them. Needless to say, a pet hose is a must for bathing pugs at home. The great thing about a pet hose is that it allows you to be flexible where you bath your pug. You can use it in the bathtub, the laundry tub and for those baby pugs, even the kitchen sink. 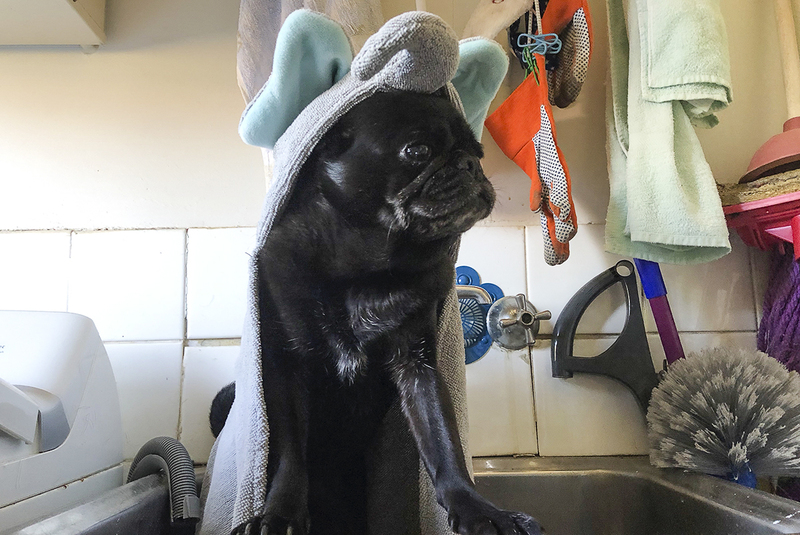 The best pet hoses have bristles on the head of the hose allowing you to brush your pug as you wash them to help rid those lose hairs. Now when bathing your pug, the last thing you need is your drain clogging up with all of that pug hair coming off your pug. Who needs the added expenses of a plumber coming out? Problem solved. You need a drain cover. These are specifically designed to stop hair from going down the drain. Suction caps of sorts to help it stay in place and a dome shaped cover that still allows water to flow easily whilst stopping hair going down the drain. These are a much more cost effective option than a plumber. Plus a paw shaped one never goes astray either. The hardest part of bathing a double coated pug is getting them dry. Because their costs are so thick, two regular bath towels are just not enough to get them dry. And quite often, pugs aren’t all that keen in getting a blow dry and unless you have a powerful hairdryer, it’s just not that helpful. Finding that perfect pet bath towel that is absorbent is a must. You may even want two per pug. There are plenty of cute but not so practical pet bath towels on the market, like the adorable elephant one Ref has. But for a good quality absorbent towel that is not only good for bath time but also taking to the beach, lake or pool, is the Doog Swim/Bath Towel. It acts like a shammy so you can wringe the water out and keep using it. As most pugs have a double coat, and those that don’t still have a thick coat, this is the perfect towel for getting them dry. 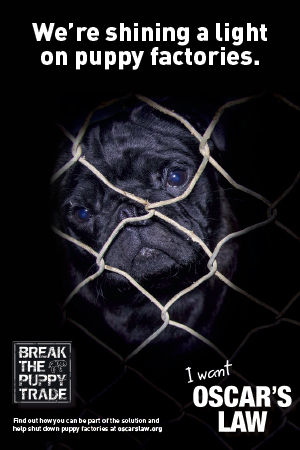 Taking care of your pugs wrinkles is one of the most important things you can do for them. Why? Because if you don’t, they are bound to get infections in their wrinkles that at its worse could involve surgery to remove a wrinkle. Scary right? So keeping on top of your pug’s wrinkly hygiene is a must. Wrinkle care for your pug is pretty simple. You need only three things and to do it once a week. The first is some unscented baby wipes. Because the baby wipes are gentle, using them to clean your pugs wrinkles makes sense, not to mention cost effective. A good wipe in the creases of each fold using a baby wipe will remove any dirt and debris from the area. It is important to follow it with a tissue to remove any excess moisture from the folds as it is a breeding ground for bacteria. 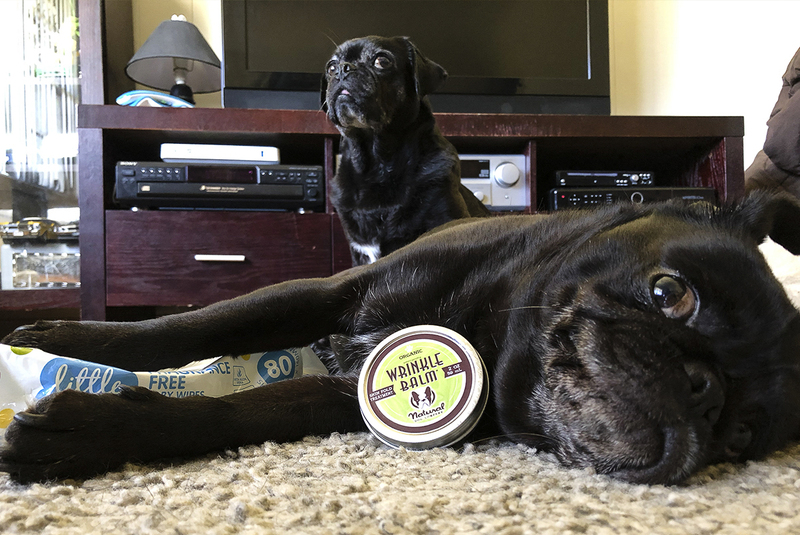 Now it seems counterintuitive to remove moisture from their foods and following it with some more moisture but finishing off your pugs wrinkle care with the Natural Dog Company’s Wrinkle Balm is a good way to ensure no infections occur. Why? Simply because the Wrinkle Balm is packed full of goodness that will help fight off any infections that may be starting and prevent any from occurring. It is jam packed full of antifungal goodness that prevents and treats skin fold disease such as yeast and bacteria. It will keep the area clean and smelling good too. A small amount goes a long way with the Wrinkle Balm so a tin of this should last you a while. Single handily the most important grooming task for your pug is keeping their teeth in tip top shape. Why? Because poor dental hygiene leads to ridiculous amounts of other health problems. 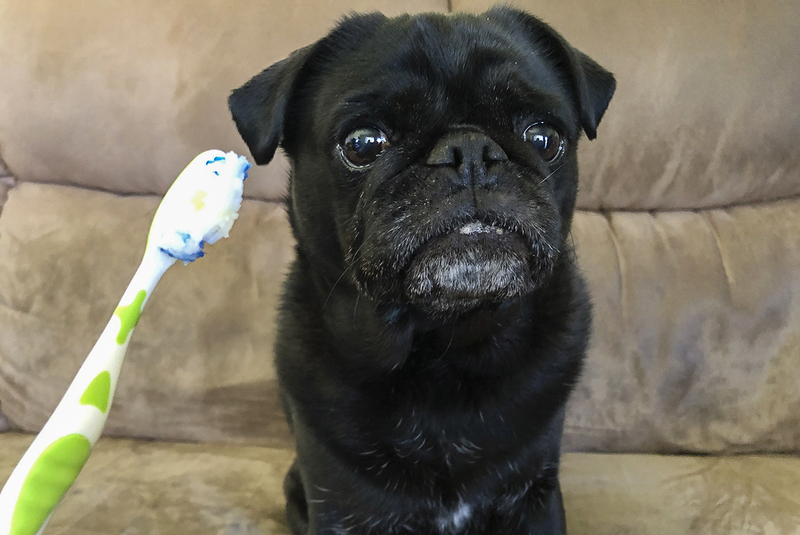 There are many ways you can keep on top of your pugs dental hygiene but none is more effective than just brushing their teeth. But you need to be careful of the toothpaste you use for this as there is some rather nasty stuff of the market. This is where the Natural Dog Company steps in with their Canine Clean Dental Scrub. This all natural toothpaste is made from not only natural ingredients but ingredients that are proven to clean teeth and help prevent periodontal disease. With just 3 ingredients of baking soda, salt and essential oils, your pugs teeth will be kept clean preventing expensive vet bills. Choose a toothbrush that is easy for you to clean your pugs teeth, add a little Canine Clean Dental Scrub, brush their teeth at least once a week and you’ll have a pug that has pearly whites, fresh breath and healthy organs that aren’t being poisoned by tooth decay. 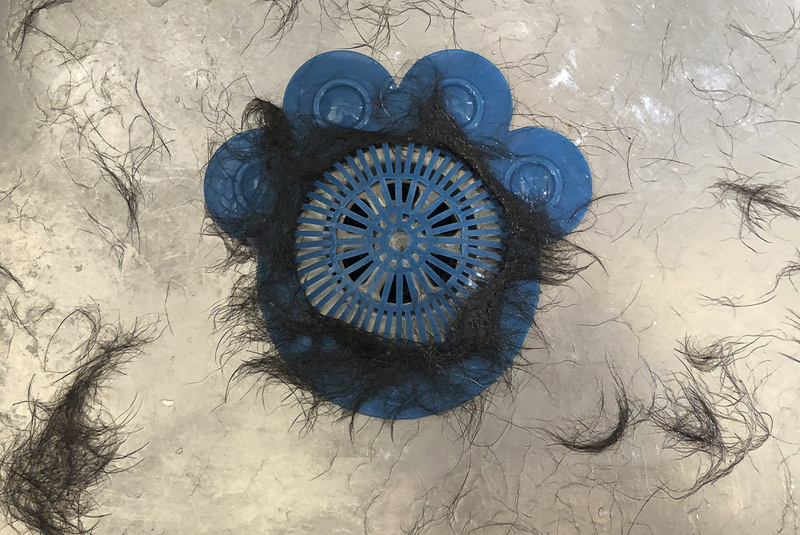 If you missed part 1 of our 10 essential tools for grooming pugs, be sure to check it out and let us know your favourite grooming tools below!